Shayla Clark (center) and Destiny Knuckles (right) help Carlton McLeod register to vote in the upcoming election. 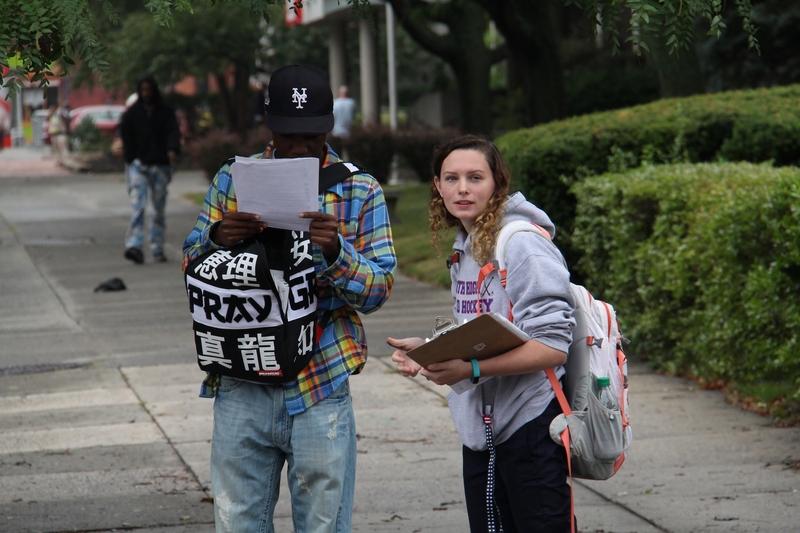 September 27, 2016 (Updated October 19, 2016) — On a recent Tuesday morning on Albany’s Washington Avenue, Saint Rose sophomore Marys Christie watched the foot traffic and had an insight about American democracy. Jeffrey Vick and Kelsey Baldwin offer passers-by the opportunity to register to vote in the November election. 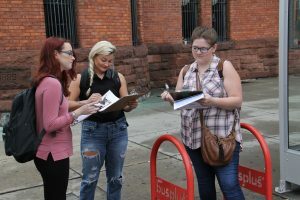 Students (l-r) Marys Christie, Blake Vaisey, Jeffrey Vick and Kelsey Baldwin seek to register new voters on Albany’s Washington Avenue. 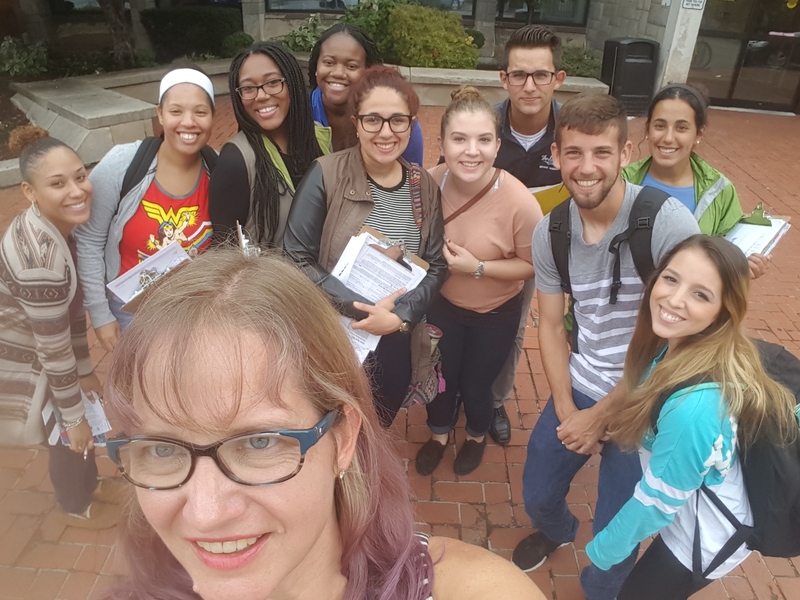 Prof. Ryane Straus with some of her students before heading out to register new voters in Albany. Students said they found the experience rewarding, though some commented on how they felt slighted by people who ignored them. Some were struck by how many people said they were registered to vote – and they wondered how many actually voted. 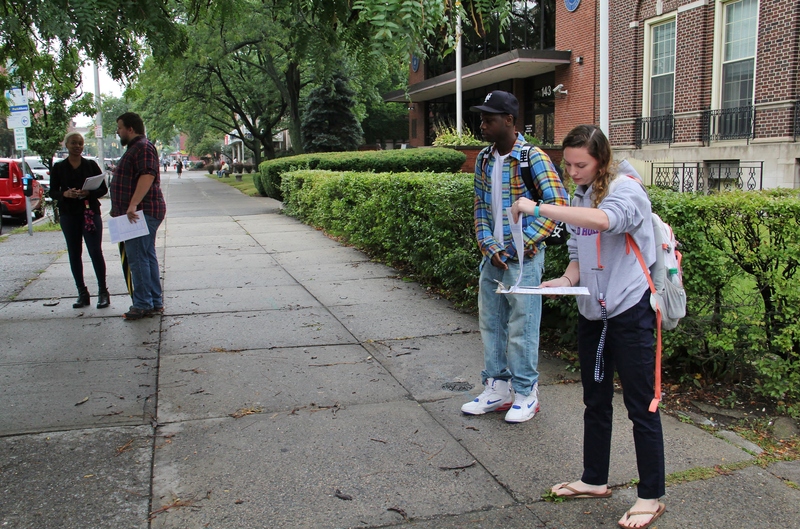 Some students found it easier than others to approach strangers. But by the end of the exercise they had collectively registered 20 new voters. Editor’s update: Straus’ students registered 69 new voters, including 38 who live in Albany County, and arranged for 25 absentee ballots.